By now, you’ve probably heard the news about the Catholic Church invalidating the use of gluten-free hosts for the sacrament of Holy Communion. "Vatican asks bishops to ensure validity of matter for Eucharist"
"Q: One of my fellow-parishioners has a violent allergy to wheat, so he can't receive the Eucharist under the form of bread. He has to receive from the chalice instead. Why can't priests get permission to use some other type of unleavened bread at Mass since some people have this problem? -Helene"
This news has riled up many in the gluten-free community. It's nothing new and it has been this way for a long time. In the Catholic Church, it is impossible to consecrate anything other than wine (or mustum) and a host made of wheat and water. No priest or bishop can change 2,000 years of tradition and faith. According to "Celiac Disease and Eucharistic Communion" by Anne Bamberg. The Jurist, 2003, 2001 (61), pp.281-289., the debate began in the 1970s. The large celiac populations of Ireland and Great Britain began asking questions of the Church. Note from Al: I found Anne Bamberg's article very interesting. I highly recommend it. She describes celiac disease very well and shares some interesting insights into the Catholic faith. 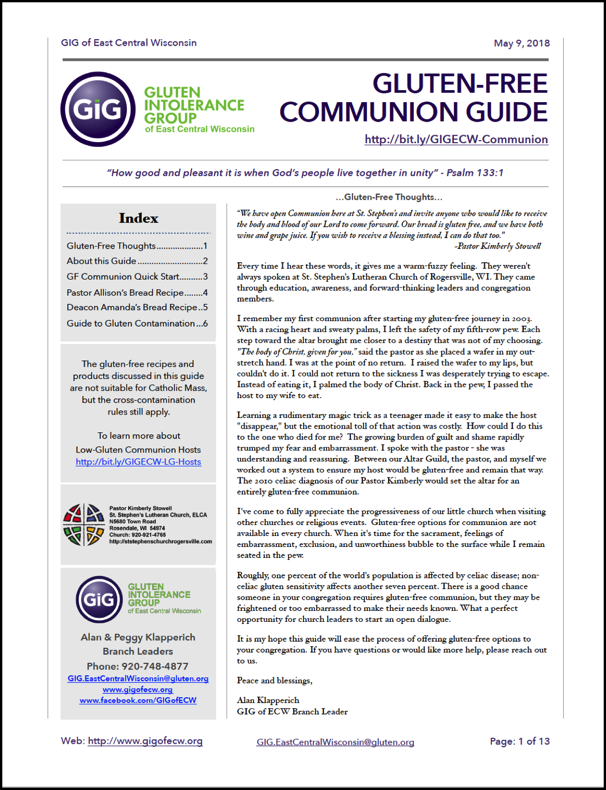 The use of low/no gluten hosts has been reviewed by the Vatican several times over the years. In 1995, then Cardinal Joseph Ratzinger, Prefect of the Congregation for the Doctrine of the Faith, takes up the subject in his June 19th letter to the Conference of Bishops. "Given the centrality of the celebration of the Eucharist in the life of the priest, candidates for the priesthood who are affected by celiac disease or suffer from alcoholism or similar conditions may not be admitted to holy orders." Yes, this means someone with celiac disease could not be an ordained priest. The Supreme Pontiff did not approve Cardinal Ratzinger's letter as it failed to seek out a favorable solution for sick or disabled persons. In 2001, then five-year-old Jenny Richardson and her parents made national headlines for leaving the Catholic Church after Cardinal Bernard Law denied her a rice wafer for her First Communion. The Congregation for the Doctrine of the Faith has been for many years studying how to resolve the difficulties that some of the faithful encounter in receiving Holy Communion when for various serious reasons they are unable to consume normal bread or wine. A number of documents on this question have been issued in the past in the interest of offering Pastors uniform and sure direction (Congregation for the Doctrine of the Faith, Rescriptum, 15 December 1980, in Leges Ecclesiae, 6/4819, 8095-8096; De celebrantis communione, 29 October 1982, in AAS 74, 1982, 1298-1299; Lettera ai Presidenti delle Conferenze Episcopali, 19 June 1995, in Notitiae 31, 1995, 608-610). In light of the experience of recent years, it has been deemed necessary at this time to return to the topic, taking up the above-mentioned documents and clarifying them wherever necessary. 1. Hosts that are completely gluten-free are invalid matter for the celebration of the Eucharist. 2. Low-gluten hosts (partially gluten-free) are valid matter, provided they contain a sufficient amount of gluten to obtain the confection of bread without the addition of foreign materials and without the use of procedures that would alter the nature of bread. 3. 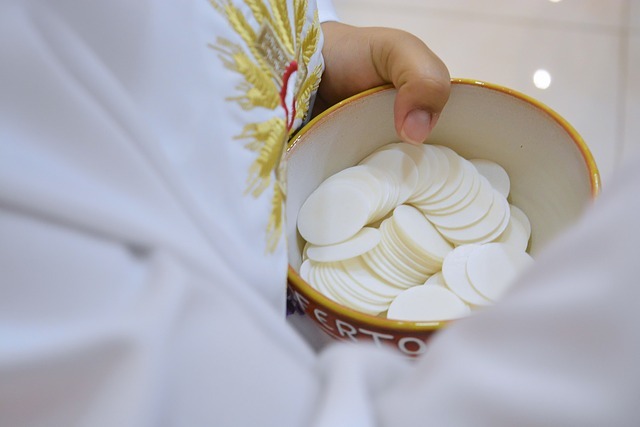 A priest unable to receive Communion under the species of bread, including low-gluten hosts, may not celebrate the Eucharist individually, nor may he preside at a concelebration. 4. Given the centrality of the celebration of the Eucharist in the life of a priest, one must proceed with great caution before admitting to Holy Orders those candidates unable to ingest gluten or alcohol without serious harm. In 2004, eight-year old Haley Waldman of New Jersey, had her First Communion declared invalid because a rice based wafer was used. As one would imagine, low-gluten (not gluten-free) hosts would be a hot topic for the gluten-free community. The question becomes, how much gluten is in a low-gluten host? 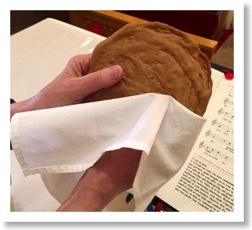 When the Benedictine Sisters of Perpetual Adoration first created their Low-Gluten Altar Breads, Dr. Alessio Fasano helped test the wafers in 2004. They tested at 100 parts per million. This is 5x more than the FDA currently allows for a gluten-free product. Gluten-Free Watchdog graciously granted GIG of ECW permission to share the testing results. Thank you, GFWD for your hard work and dedication to the gluten-free community! If you're not a subscriber, please consider becoming a member. How much gluten is safe? Yes, they contain more than 20 ppm - 50 ppm and 63 ppm for their respective samples. Nope, not gluten-free by FDA standards, hence the name - low-gluten. As GFWD points out, parts per million is a ratio. It tells us the amount of gluten per kilogram (2.2 pounds) of food. Knowing the amount of food eaten will determine how much gluten has been consumed. Testing reveals that a wafer weighs about 33 milligrams and contains .0019 milligrams of gluten. A one-ounce slice of bread weighs about 28,350 milligrams. A one-ounce slice of gluten-free bread (if it contained 19 ppm of gluten aka gluten-free according to FDA regulations) would contain roughly 0.57 milligrams of gluten. That slice of GF bread could contain 300 times more gluten than one Low-Gluten Communion wafer. On July 10th, 2017, two days after the Vatican issued their statement, The Benedictine Sisters of Perpetual Adoration in Clyde, Missouri issued their own statement regarding their wafers. (CLYDE, Mo.) - The Benedictine Sisters of Perpetual Adoration in Clyde, Missouri, have made Vatican-approved, low-gluten altar breads since 2004. These breads have been tested by independent laboratories and deemed safe for use by many people with Celiac Sprue Disease. The Benedictine Sisters of Perpetual Adoration were the first U.S. low-gluten altar bread producers approved by the Vatican. As early as the 1990s, the Benedictine Sisters started receiving requests for gluten-free hosts. With support from the Office of Divine Worship of the United States Conference of Catholic Bishops, the Benedictine Sisters produced a host compliant with the requirements of Canon Law and suitable for thousands of low-gluten customers around the world. These sales began in 2004, and the wafers have been approved by the USCCB for use in all U.S. dioceses. The Benedictine Sisters are the largest religious producers of altar breads in the United States, making almost 9 million hosts each month. The low-gluten breads are produced in a separate facility in order to prevent cross-contamination. The low-gluten breads are made from water and wheat starch that has had most of the gluten removed. 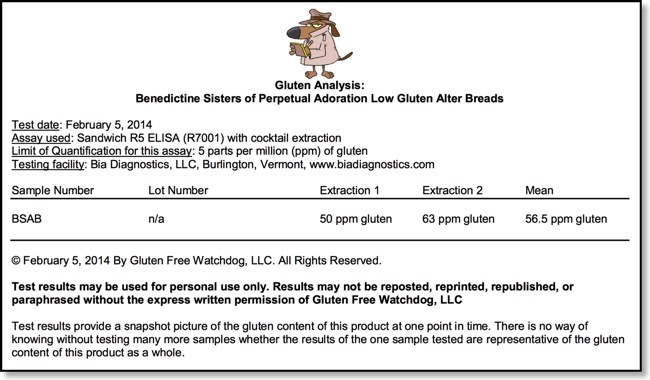 In 2004 Dr. Alessio Fasano, at the time director of the the Center for Celiac Research at the University of Maryland*, maintained that the amount of gluten contained in one of the Benedictine Sisters’ low-gluten altar breads (tested at < .01 percent) was so minute that someone diagnosed with Celiac Sprue Disease would have to consume 270 wafers daily in order to reach the danger point. A test done in 2016 indicated the gluten content was even more minimal - less than .001 percent. There are some people who are so sensitive to gluten that even the tiniest amount can cause discomfort. The Benedictine Sisters follow the recommendation set forth by the USCCB that those with such a serious gluten sensitivity discuss their condition with their pastor or Eucharistic minister. If the parish offers a separate chalice for Celiac sufferers, he or she may partake only of the Blood of Christ. It's best to avoid chalices that are used by those digesting regular altar breads because cross-contamination may occur. More information about the Benedictine Sisters’ low-gluten breads can be found at https://altarbreadsbspa.com/low-gluten-use-storage/. *Dr. Fasano is now with the Center for Celiac Research and Treatment at Massachusetts General Hospital in Boston. You may have noticed above I bolded "A test done in 2016 indicated the gluten content was even more minimal - less than .001 percent" . I completely missed that upon my first read through. It's a very important sentence to the gluten-free community. The Sisters use decimal percentage numbers in their communiques instead of parts per million. For those "mathematically challenged" individuals (yeah, that's me alright! ), it doesn't sink in too well. If we do the math (What?!?! I was told there'd be no math! ), we find that .001% of gluten is really…drumroll please…10 parts per million. TA DA! On July 18th, Center for Celiac Research and Treatment issued their response in a video. "…provided there is some form of wheat in the wafer - no matter how much - that would be valid for communion. That’s the reason why the Benedictine Nuns produced these wafers that has 10 parts per million and they’re safe - so that definitely you have to be [?extremely religious? hard to make out those two words] to be over the threshold - in other words you’d have to take hundreds of those to be in trouble. Nothing has changed." “The wafers - that the Benedictine Sisters when they first started producing them in 2004, they were 100 parts per million. But in a recent letter they sent out on this subject, they have retested their wafers and they are less than 10 parts per million - so completely safe for those with celiac disease." As I was watching this "disturbance in the force" play out, I was becoming more and more disheartened. People were upset with the Church, people were upset with organized religion in general. I was seeing a lot of stone casting, but no one focused on "How much gluten constitutes a low-gluten wafer?" Making choices about ones diet is a personal matter. Factor in a spiritual practice, and it complicates the matter exponentially. If you're not the religious type, this situation may not make much sense to you. That's fine, this is not your issue to tackle. Please feel free to move on to a more suitable topic. If you are the religious type, particularly Catholic, this situation was likely to induce some level of stress. Sometimes, difficult decisions must be made. I share these facts neither in-favor-of nor opposition-to, but in an effort to help others make an informed decision. We now know a low-gluten wafer contains magnitudes less gluten than a slice of gluten-free bread. We now know the wafers from The Benedictine Sisters might very well qualify for GFCO certification (made in a dedicated GF facility and less than 10 parts per million of gluten). I hope these facts make it easier for someone to reconcile this conundrum.